*Tonight's my twin nieces Christmas Pageant at their preschool.. I totally cant wait to see all the little ones up there. With Sophia (aka Miss Dramatic) in her element... (A STAGE!!!) & with Madilynn (aka Miss DONT LOOK AT ME) ignoring everyone thinking, "If I dont look at them, they wont look at me"... Oh, be aware that pictures WILL be taken!!! *SNOW!!!!!!!!!! 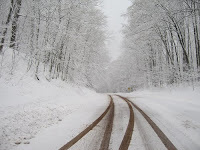 We have snow forcasted EVERY DAY up until Christmas! And this weekend can drop us a few inches... which really isnt cool when you still have some Christmas shopping to do. At least I have my little 4 wheel drive... maybe it'll keep the stores less crowded? Nah - it'll just be crazy people in the SNOW now... oh, this can't be good!! *So You Think You Can Dance... I just didnt even care this year...an hour long finale when they've drug out the show for 10 hrs every week? And Russell? I mean, I liked the dude, but Jakob was by far the best dancer... it was just stupid this year...Fingers crossed Ryan gets snagged up on "Dancing with the Stars"
*I saw my counter top for the first time last night after HOURS of wrapping... but the kitchen table is still MIA. I know its under there somewhere! *Did you see all the nominations for GLEE for the Golden Globes? And Jane Lynch even got a shout out... totally deserved!!!! I was so excited when I heard that. Picked up the GLEE 2 Soundtrack & its even BETTER then the first! I listen to them over & over & never get sick of it... GLEE has some sort of mystic powers that drags you in - I'm sure of it... I also just read that Sue Sylvester will be having her own song to sing in the next round of shows... I love any scene Jane Lynch is in... cant wait! 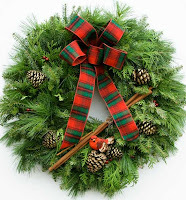 *Our boss received a live wreath for a Christmas present & he let us put it up on the door in the office. Can I say, all you live tree people, I see where the smell drags you in to getting a live tree. Every morning when I open the door, that smell in the office is just so heavenly...makes me sad though that its dying... I want that smell around here longer! *We had our Youth Christmas party Wednesday... As always when we're all together, I laughed so hard, my belly hurt, I lost my voice from singing Karoke (or SCREAMING Karoke, I should say), and yes, if you saw my Facebook - I even ate Pla-Do!!! All the other leaders were talking about how they've eaten it before & how salty it tasted... Someone say salt? I was intrigued. So our youth minster took the first dive into it & then I had to try it myself... afterall, it was the beautiful pink color... and WOW - it is MAJORLY salty... who knew? I've said it before & I'll say it again - it takes a certain kinda people to work with youth - & I think I just proved it once again! 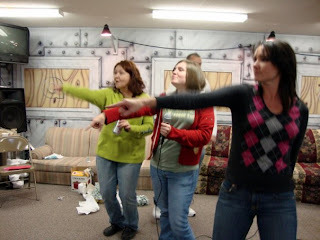 Here we are singing YMCA... notice I dont even put down my Diet Coke to rock out! 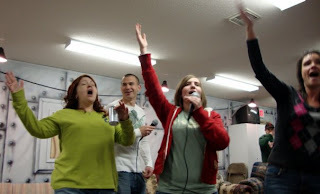 And no, I'm not singing a heart moving hymn here... we're not raising our arms praising God - we are doing the moves to YMCA... but my emotion in this song is just TOO much ... & Ryan watching me is even more hilarious! Now that's good times right there! Happy Friday everyone! May it be FABULOUS! thanks for the update. Sounds great! That last picture is hysterical!!!! I truly hate that I missed those moments! I saw from Jeremy's video Ryan singing...that was hilarious! Totally cracking me up, you Diet Coke wielding youth leader!! CRACKING.ME.TOTALLY.UP. And can I just say, that SYTYCD left a lot to be desired for me this season as well. I really liked all the finalist all great dancers. But I'm with ya, Ryan and his shirtless self, needs to get right on over to DWTS!! Love our fireplace and LOVE, LOVE, LOVE Glee!!!!! Wish you could keep snow there! I really am not looking for snow in my area. Hope your neither of us get too much! I love Glee and I love your YMCA nusical!! Those songs just make you smile and have fun. I'm excited about the snow as long as it holds out till late tonight. Had to turn my word verification back on for the same reason - sad. Oh I would die, I'm allergic to trees. I felt so bad one year because the family I nannied for got a real tree and I could barely breathe so they were forced to put their Christmas tree out on the porch. Oh...and our new house has a fireplace!!!!!!!!!!!!! It looks like ti was a fun party. Way to sing, er scream. I would like the scent of pine in my home too, but it is just too small. I keep a pine scented candle, unlit near the tree. It's scent may not go through out the whole house but a good part of the room anyway. I have Dec 29th marked on my calendar; the release of season 1 of Glee! Can't wait! Love the pics of you with the youth; rock on, sister! What a fun week and a lot going on. Have a great weekend.. I had a feeling about SYTYCD... as soon as Kathryn was eliminated and it came down to Russell and Jakob, I was pretty sure Russell was going to win. Jakob was brilliant, but Kathryn was my favorite this season! Loved your Friday fragments! Looks like a busy week for you. I love that you just found your counter top. Mine's been MIA along with my tabletop until late last night. I feel like a huge weight was lifted. AHHHHHHH! Love that you keep hold of your diet coke..lol. 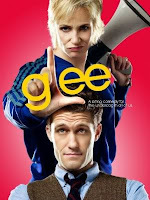 ..oh and Glee..I LOVE IT> not on again til April..dang! I might have to turn my word verification back on, too - I guess it's this time of year for them to start crawling out of the woodwork! I love those YMCA picture! It looks like you guys were having a blast. We have a fake tree but get the nice Christmas tree smell from a little centerpiece with tree branches in it. It works brilliantly! Stupid spammers! I moderate my comments so that people don't have to do word verification, but I'm not really sure that's a better solution either! I've been getting alot of spam too. I think I'll turn the WV back on as well :( stinks. LOVE those pics of ya'll singing! So fun! Mr.4444 says we can get a fake tree over his dead or disabled body. Bummer. I hate it when the voting shows turn out so stupidly. American Idol? Perfect example. Your depiction of your little nieces was really sweet. I hope you've posted pics, as I plan to look for those next.